Mandvi (Kutch) Beach is the key attraction of the region which is located along side the 1,666 km long coastline of the state of Gujarat. This beach is a perfect holiday destination which has sunny beaches and warm tropical waters. Mandvi Palace is also situated near this beach, which features a museum of princely heirlooms. The palace is also known as Vijay Vilas Palace and has featured in Hindi movies, such as ‘Hum Dil De Chuke Sanam’. The famous song of this movie ‘Chand Chupa Badal Mein’ was shot at the Vijay Vilas Palace in Mandvi. Mandvi Creek in the region is inhabited by flamingos and other bird species, making it popular among birdwatchers. 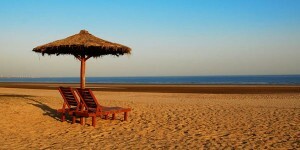 Mandvi Beach is only 133 kms away from Kutch Resort.